In the midst of a rapidly changing society, Chinese news source choices are clear and consistent with those of publics across the globe: television dominates. This tendency to turn to television is not new – overwhelming majorities in China reported using television as a news source in both 2002 and 2007. Many also turn to newspapers, but in China, as in much of the world, newspaper readership is in decline. Fewer turn to the internet, although the number of people going online for news has risen slightly over the last year. Young people, the well-educated and the wealthy are considerably more likely than others to name the internet as a top news source. And these same groups are much more likely to use the internet generally, as well as to own computers and use email. Nearly all Chinese (96%) say television is their first or second choice for international and national news, and fully 88% say it is their top choice. 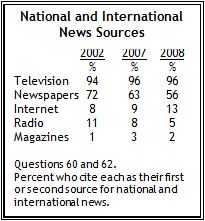 A majority (56%) say newspapers are one of their top two sources, although just 5% turn first to newspapers. Only 13% say the internet is one of their top two sources, and even fewer turn to radio (5%) or magazines (2%). The dominance of television news is not new – about the same number of people mentioned television in 2007 (96%) and 2002 (94%). On the other hand, newspaper usage is in decline among Chinese. Just over half (56%) still consider newspapers one of their top news sources, but this is down from 63% last year and 72% in 2002. Radio usage is also in decline, dropping from 8% last year to 5% this year. The trend is the reverse for the internet. While few go online for national and international news, slightly more name the internet as one of their top two sources now (13%) than did so a year ago (9%). Chinese news source choices are consistent with those of publics worldwide.5 In 2007, fully two-thirds or more in 44 of the 47 countries surveyed said that television was their first or second choice for national and foreign news. At the same time, newspapers functioned as a secondary source of information in every country surveyed, although readership had declined steeply in many countries between 2002 and 2007. Highly educated, high income, and urban Chinese are particularly likely to read newspapers and use the internet for national and international news. Those under age 30 are also more likely to go online, although they are actually less likely than those age 30 and over to read newspapers. More among the high school (73%) and college-educated populations (57%) get Chinese and world news from newspapers than do those with less than a high school education (45%). Similarly, while nearly four-in-ten (39%) of those with a college education or more turn to the internet to get national and international news, only 14% do of those with a high school education and 4% of those with less than a high school education. A similiar pattern exists when considering income. More in the highest income bracket rely on newspapers (70%) and the internet (21%) than do those in the middle-income (63% newspapers, 16% internet) or low-income groups (46% newspapers, 6% internet). Urban areas are havens for newspaper and internet users. Far more among city-dwellers (77%) and those living in towns (56%) turn to newspapers than do those in more rural areas (31%). People living in more urban areas (15% city, 20% town) are also more likely to turn to the internet for news than are those in rural areas (4%). Internet news consumers also tend to be younger. One-third of those ages 18-29 turn to the internet to get news about national and international news. Only 13% among those ages 30-39 go online for news, while fewer still do so among people ages 40-49 (7%) or 50 and over (2%). Those in the 18-29 age range are, however, less likely than people age 30 and older to rely on newspapers for news. 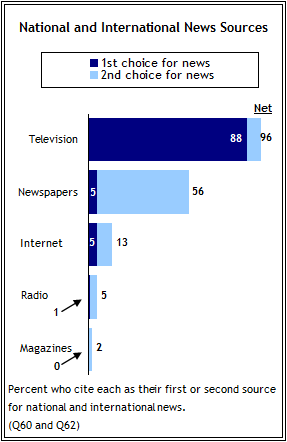 Most computer owners (95%) and internet (95%) and e-mail users (92%) also opt to get their news through television programming. However, these tech-savvy Chinese are far more likely to name the internet as one of their top two sources of news than are non-owners and non-users. Computer owners (63%) and internet users (61%) are also more likely to get their news from newspapers than are non-computer owners (52%) and non-internet users (53%). A majority (62%) of Chinese who access the internet as a primary or secondary source for national and international news use the major internet news sites of Sina or Sohu. Solid and nearly equal percentages volunteered that they use Sina or Sohu as well as other internet sources (18%), or sources other than Sina or Sohu (19%). When searching for information in a crisis, most Chinese rely on television. Seven-in-ten say that if they heard about a problem with food or water safety that might affect them or their family, they would turn to television for more information. Far fewer, but still more than one-in-ten (13%), would turn to newspapers – more than double the percentage of Chinese who first turn to newspapers for information about national and international news. Just under one-in-ten Chinese would look to the internet (9%) for information. A majority (56%) of those who choose the internet as their primary source for food and water safety-related information would go to the major news sites Sina or Sohu. Nearly one-quarter (23%) would go to internet sources other than Sina or Sohu, while 19% volunteer that they would go to Sina and Sohu and other internet sources. 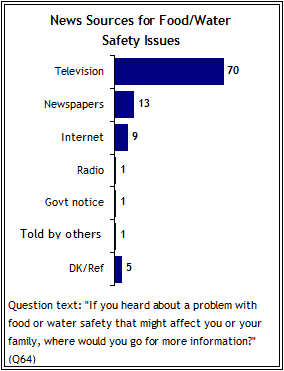 Just as with national and international news, information sources for food and water safety issues vary by age. Chinese age 50 or older (76%) are far more likely to turn to television for health and safety related news than those ages 18-29 (61%). Meanwhile, 18-29 year-olds are especially likely to favor the internet as a news source (21%). Television is relatively less important, and newspapers and the internet more important, for well-educated, wealthier, urban, and tech-savvy Chinese. Just under half (48%) of those with a college education or more would rely on television, compared with nearly two-thirds (65%) with a high school education and nearly eight-in-ten (79%) with less than a high school education. More than one-fifth (22%) of college-educated Chinese would rely on newspapers while more than one-quarter (26%) would turn to the internet. Far fewer with less than a high school education would choose the same sources (7% newspapers, 3% internet). The same patterns hold when considering income. Those in the highest income bracket would rely less on television (55%) and more on newspapers (23%) and the internet (16%) than those in the lowest income bracket (76% television, 9% newspapers, 4% internet). City dwellers (26%) are especially likely to turn to the internet for this kind of information and are less likely than those in medium sized towns or rural areas to turn to television (60%). As with national and international news, tech-savvy Chinese would tend to go to television programming for food and water safety-related news. Still, more computer owners and internet users would turn to newspapers and the internet than non-owners and non-users.